I have got new ear moulds with 0.8mm vents. Yesterday the pressure in my ears was so large and painful that both my ear drums burst. The out of hours ENT said I need bigger vents in my ear moulds to stop the pressure build up. I thought that a 0.8mm size vents would stop the pressure, anyone know? I have got a conductive loss so require a lot of power. The software recommends a 0.8mm to 1mm vent. I don’t get it. Your maximum hearing loss is 75dB at 2kHz. I’ve got 70dB when I have a cold and program them at all middle frequencies. Never had a burst drum. This sounds odd. The 0.8mm vent would be enough. My audiologist only thought that it could lead to some occlusion. If I would have to haphazard a guess, I would think that your vents got clogged up and the ear was able to slip out of the volume between drum and mold, but not in again: the mold acting as a valve. I’ve had this experience with power domes, before. Do you have a lot of ear smear? I’ll blow my vents out with the blower thing I’ve got to see if they are blocked. I wonder whether I’ve had a middle ear infection brewing. I had a lot of middle ear infections anyway, that’s why I’ve got a conductive loss because of it. I had a ear drum burst was after flying on landing. That’s a lot of pressure probably from the infection alone. I assume you removed your hearing aids when the pain started/continued? And that the pain continued? Until the drums burst? It was the removal of the ear moulds that I think burst my ear drums. The pressure stayed in my right, but not my left. Ear pain is the worse. I’ve had major spinal surgery and I would say the ear pain was more painful then my spinal surgery. 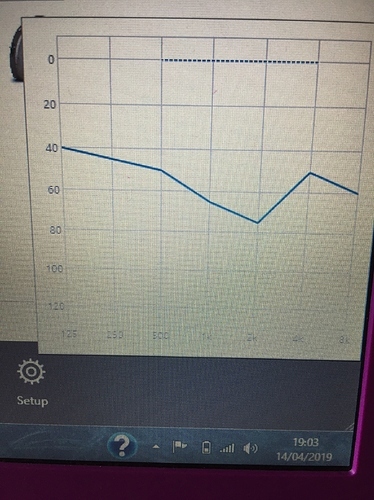 This is how my audiogram looks with bone conduction results. According to Dr. Cliff, your right aid can be vented 2-3mm. Your left 0.5 - 1.0mm. My right also has a conductive loss so requires a lot of power. The Phonak Target Software says 0.8mm for my left and 1mm for my right. From my limited experience, I find no reason to stray from the Targets vent values. I couldn’t watch dr. Cliffs’ video, though: Too much for a Monday morning! When the audiologist logged my word recognition scores into Noah, the Phonak Target software tweaked the recommended acoustics further. So instead of power domes, it finally recommended custom molds. (Something we already knew, but nice to see the software getting it right.) It already recommended 0.6-0.8 for the one and 0.9-1.1 for the other. Both values were discussed (0.6-0.8 could cause minor occlusion) and approved by the hospital audiologist. @Zebras Why do you stress the conductive loss aspect? Are your air and bone hearing levels very different? Are your air and bone hearing levels very different? 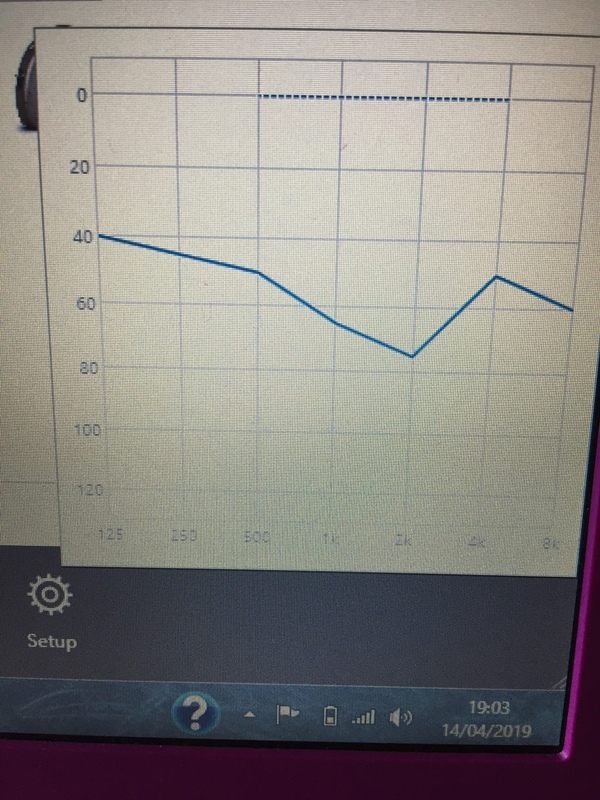 My Bone Conduction results are between 5 dB and -10 dB so I have a purely conductive loss, no sensinural loss at all. It’s annoying that I can’t put my BC results into the audiogram on this site. Did you tried occulsion compensation option in phonak software if not set it to max. And always enter bone conduction to software as it’s not within normal range. Really sorry to hear about your troubles. It must be very painful. I’ve traveled a lot over the years and a few times been in agony on final descent after a long overseas flight due to a collapsed ear drum. I’ve never had a ruptured ear drum. I have substantially worse hearing (conductive hearing loss + sensorineural loss) than you in my right ear (90 dB) and there is no vent in the mold, which has a 105 dB receiver. I would be really surprised if your blown ear drums were caused by your HAs, unless perhaps they fit very tightly. I’d be much more inclined to suspect the root cause to be a middle ear infection. I’d be much more inclined to suspect the root cause to be a middle ear infection. You’re right. It was 2 x middle ear infections with swollen ear drums. I’m on antibiotics now due to my issues in the past with infections causing more hearing loss. Really sorry to hear that. Get well soon.